Cottage Handcrafts is a family run business, situated in Connemara, Ireland. 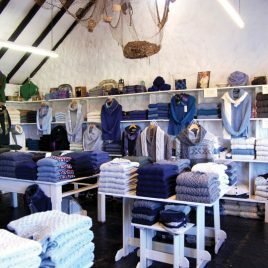 It stocks a wide selection of Irish knitwear, handmade jewellery, handmade pottery and glass, knitting wool and patterns, local crafts and paintings. Upon entering our quaint cottage, you will discover an extensive selection of knitwear which we have lovingly sourced from all over Ireland. We offer so many styles to keep you warm from the traditional handknit Aran Sweaters to contemporary capes, jackets and woolen accessories. Our craft range includes the world famous Connemara Marble, handmade pottery and jewellery, local crafts, knitting wool, and paintings from local artists.